So far this week we have looked at two truths: the Infinite Life of God, and the fact that God is the light that we need to walk in. 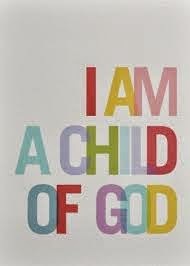 Now for truth #3: We are children of God. Honestly, I am overwhelmed! Our English word lavish comes from the French for bathe: laver. I am bathed in God’s great agape forever, as His child. John has said it before: To all who received him (Jesus), to those who believed in his name, he gave the right to become children of God—children born not of natural descent, nor of human decision or a husband’s will, but born of God (John 1:12-13). Instead of the amnion of natural birth, I am covered in the love of rebirth. Anyone needing to know that you are loved like that by God? Well, you are! Let me introduce you to a group of girls in Kenya who are in deep need of the love of the Father. Meet Carolyne. Christmas of her eighth grade, Carolyne went to visit her Masai grandmother in the interior. Early the next morning she and her girl cousins, all around age 13, were subjected to the ancient tribal rite of passage known as FGM. The procedure is one of barbaric mutilation, performed with dirty scissors and frequently resulting in hemorrhage or infection. The girls are forced to leave school and marry a much older man. Without FGM there will be no marriage, hence no dowry to her family. If the girl refuses, she is kicked out of her home. Rescue is the only solution. Carolyne’s family had abandoned the tribal ways when they became Christians. Her mother wept with her when she returned home and fully supported her schooling. She was one of the lucky ones. More of Carolyne’s story tomorrow. In the meantime, the Christian community in Kenya is rising to the occasion, providing housing, schooling, books and love for the Rescue girls, as they have become known. If there’s one thing these girls need to know, it’s that the Father longs to lavish His agape love on them, to call them His children.